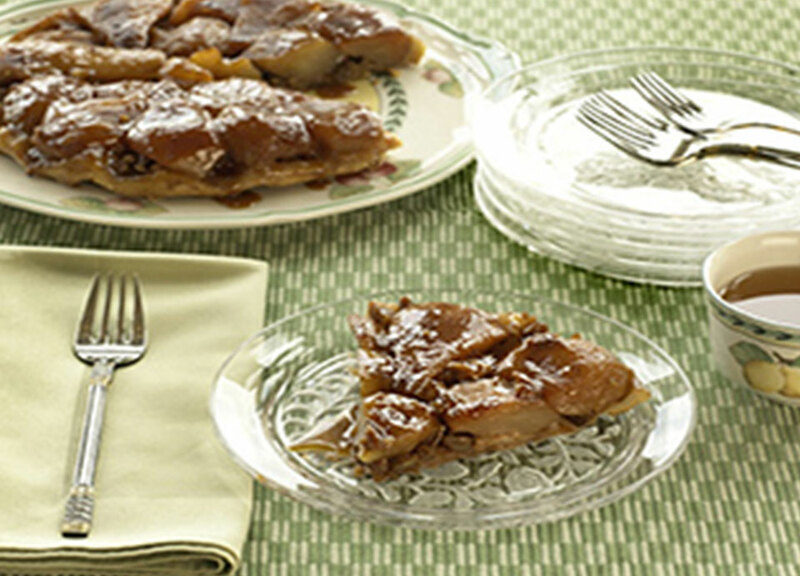 In this dessert, I take the recipe for the classic French dessert tarte tatin–with its quercetin-containing apples–and add pears for their copper content and pecans and cinnamon, which are high in antioxidants. It is worth noting that when used in sufficient amounts, cinnamon also has anti-blood-clotting agents and anti-inflammatory properties and may help stabilize blood sugar levels. 2. In a cold 8-inch cast-iron skillet, lay 1/2 of the butter pieces, evenly spaced. Sprinkle 1/2 of the sugar mixture over the pan. Lay the fruit, cut side up, over the butter and sugar, covering the entire pan. Pack the fruit tightly to avoid shrinking during cooking. 3. Squeeze the juice from the lemon over the fruit. Sprinkle the remaining 1/2 of the sugar mixture over the fruit. Dot with the remaining butter. 4. Place the skillet over medium-high heat and cook the fruit mixture until the butter melts and the sugar caramelizes, about 20 minutes. If hot spots develop, rotate the pan but do not stir the fruit. 5. Remove pan from heat and sprinkle the pecans over the fruit. 6. Top with the pie crust, folding edges into the pan so no crust is hanging over. Bake at 425 degrees until the pastry is golden brown, about 20-25 minutes. 7. Cool the pie until the caramel thickens without sticking to the pan, about 10 minutes. Turn out onto a plate before cutting and serving.